Who loves blue? I love blue! The bright blue kick I've been on is still going strong since it hit me in early 2012. Bright blue has definitely caught on to all polish brands out there over the past year and a half, and we've seen multiple versions and variations on this awesome color. Today, I have bright blue to share with you from Julie G line made by Jesse's Girl. 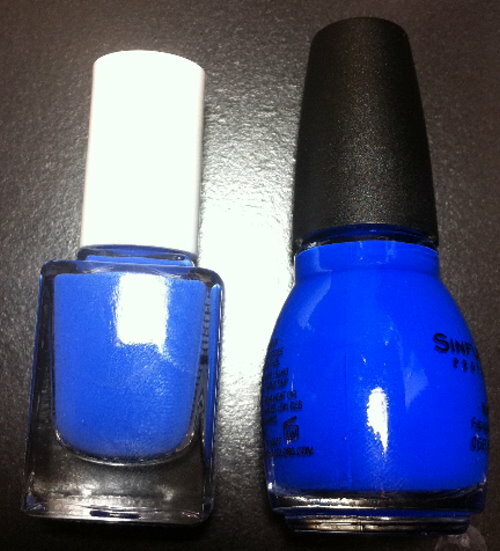 Cabana Boy is a bright medium blue creme. Color: There are a lot of bright blues out there, but they all have their slight differences. The question out there is how does this compare to the Nails Inc. Baker Street/Sinful Colors Endless Blue variety? Cabana Boy is lighter and not as saturated (see below). Formula: The formula on this was good. This applied evenly and smoothly. Price: I paid $3.99 for this on the Jesse's Girl website. You can also find this in Rite Aid stores if you are one of those lucky people who I am jealous of who have Rite Aids in your state! Overall: I like this blue. I'm sucker for bright blues as you all know though. I will say in all honesty I gravitate to the the super bright and saturated cobalt blues, and this is a touch lighter than that. There is absolutely nothing wrong with Cabana Boy though, and I like the lighter touch. Lucky for me I have 3 Rite Aids within a very close radius of where I live. I also have both of these blues and love them.